My husband and I follow professional wrestling, for those not "in the know" it is basically a male soap opera. The men and women are both actors and athletes (albeit some better than others!) who operate under a grueling schedule in a business where injuries can and do happen regularly but it doesn't stop them from performing. Often one doesn't find out until later that a wrestler managed to effectively hide the fact they were working with situations like broken bones, even necks; these aren't the injuries touted as part of the script, if you will. 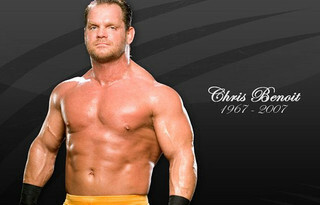 On June 24, 2007, instead of the usual Monday Night Raw, WWE aired live a tribute to Chris Benoit when the first news of his death came out. At the time they had no knowledge of anything about the circumstances and so celebrated the man he had been. I still feel this was an appropriate thing, as the Chris Benoit of that final weekend was not the Chris they knew and cared for. He is now most known for the murder of his wife and child then committing suicide. There are many, many questions and speculations why such a tragedy occurred. A plausible concern is the amount of brain damage he had that was discovered during the autopsy: "Benoit's brain was so severely damaged it resembled the brain of an 85-year-old Alzheimer's patient." Understandably (if not exactly ethically) the WWE quickly distanced itself from any possible accusations that the injuries wrestlers suffer could have that effect and in the process have removed Chris's name and likeness as much as feasible from association with the company. One sunny afternoon two weeks later I was outside in the beautiful Maine countryside and pondering on those questions when I was snatched away from the here-and-now to witness the following. I have no memory of the physical world during those long minutes. In this case I was strictly an observer; there was nothing for me to do at that time. My task was to relate this though I've been very hesitant to do so over the years. However, the excision of Chris and the banning of his name from the other wrestlers I believe may have left an unhealed wound among those who would otherwise want to talk about their memories of him. There was a sound of harsh weeping, as if it had been going on for some time. From the darkness the image of a man collapsed over his knees and sobbing formed. "What have I done? How could I have done this?" the litany continued over and over. I knew who this was then and my mind went to Nancy and Daniel, whom suddenly and briefly appeared to me. They were each wrapped in Love and Joy, completely safe and free from pain, from even the memory of it. Though he did not know it, he already had their forgiveness. That image faded and returned to the broken man and the terrible weeping. From my left a glow of Radiance began to coalesce. She stepped forward, every line and motion speaking of elegance and grace. Her gown flowed about Her in perfect opalescent folds. She sat as if upon an invisible chair, the Light shining in the darkness. Chris crawled blindly to Her, curled up against Her leg and rested his head against Her, a son seeking comfort from his Mother. "Send me to Hell," he begged, "Please, I deserve it!" "No." Her musical voice was tinged with sorrow. Her hand gently stroked his head and he began to calm as She continued, "That is not for you. You will return and serve (I received a quick view of a place of abject poverty and casual violence) where you will see some of the worst of humanity. All your life you will serve to heal these people and receive neither fame nor glory for it. This is not to punish you; this is to strengthen you against all that can happen and you will learn never to break again." I sensed his acceptance, his need that justice must and will be served by this. His relief and touch of joy that he would get to do good works and it didn't matter that he would not receive money or accolade. The Light grew brighter, overwhelming my sight, and I knew he was going to his next incarnation. I was abruptly released from the vision and remembered to breathe again. Chris is not a "bad" man. His actions were those of someone who had lost their grip on reality. It does not excuse them or release the pain, but know that he will both suffer and experience compassion in his journey to raise his soul and atone for the past.